Alison McFerran is the CEO at Letarte Luxe, a Resort Wear, lifestyle brand for women. After graduating from the University of Virginia in Charlottesville, Virginia, with a degree in sociology, Alison moved to Atlanta in 1996 to work for the Olympic Games. Alison played two Varsity Division 1 sports at UVA on full scholarship. After the summer of the 1996 Olympics, Alison moved from Atlanta to New York City getting a job in the Macy’s Executive buying training program. This was the start of a 20 plus year career in the retail fashion industry. For the next eight years, she lived in New York City and worked for brands such as Ann Taylor, Liz Claiborne and Tommy Hilfiger. She gained skills in all aspects of buying & merchandising, product development & production, sales & marketing and overall account management in these roles. Alison then moved to California accepting a position with The Gap headquartered in San Francisco. She worked in different areas of the company for over three years. While still in California, she also worked with Levi Strauss, Lilly Pulitzer and other brands. This all gave her a vast array of experiences at some of the top brands in the United States. Alison McFerran lived a bi-coastal lifestyle as most all of these companies had offices in both New York City and San Francisco so she would travel back and forth often to work with designers and vendors while visiting store locations and competitors. She gained a strong appreciation and love of both cities and coasts. Being involved in the fashion industry also allowed her to travel around the world. She has been to Vietnam, India, China, Hong Kong, Brazil, Turkey, Italy, Paris, London and more, working with design and production teams to create and source new products to distribute to the US. Alison McFerran believes that her competitive sports experience in college created a strong foundation for building team skill sets, discipline, drive and perseverance that has made her career easier to navigate. She also supported herself starting at a young age as her parents divorced so fending for herself was often a necessity. She knew nothing ever came easy in her world so digging deep and overcoming obstacles was a learned skill set from a young age. When I was a child, I would travel often to New York City with my father who was a lobbyist for all of the newspapers in New York State. We would love to go shopping together when we had free time to all of the big department stores –and walk up and down Fifth Avenue and Madison Avenue shopping all the big brands. I remember surveying the scene from the escalators and window shopping. I was mesmerized by all the product and “eye candy” and dreamed of running a brand or store someday. As I got older, I knew I wanted to go through a training program that would allow me to rise up through the executive ranks. I was so inspired and energized whenever I visited New York City that I made it my goal to live and work there after college. When you have an idea, you have to first identify the white space in the market to ensure an opportunity to be successful. Doing the proper research in order to validate your vision is compelling enough to bring to life as it’s key to be on the forefront competitively. Then, you need to stay very focused on your goal and strategies to get there with a tremendous amount of hard work, passion and persistence as every entrepreneur knows missteps are inevitable but these key learnings cause you to adjust your path and send you in the right direction to achieve your goal. When you were starting out, was there ever a time that you doubted it was going to work? If so, how did you handle it? Yes, of course – lots of ups and downs are common in building any brand. Throughout my entire life starting as a young child I played every sport possible and then focused in competitively on field hockey and lacrosse. Having spent all my time with teams and coaches, I found this experience easily translated to working with peers, bosses, managing people and ultimately navigating around all the different personalities and conflicts that would arise. I knew it was key to stay focused and be a leader if I wanted to drive a successful business and rise up the ranks in the fashion industry. I would strive for strong results working in sync with teams and trying to stay above the fray and drama. “The sum is always greater than the parts” – I knew for certain won the game! Taking the high road and staying laser focused on the tasks at hand, key initiatives and strategies is essential for driving any business. Most of all, I try to always separate myself from my emotional side and personal distractions. This was always a key area of development for me as I am a kind, caring, sensitive person filled with passion and lots of energy! I have to work hard to stay calm and channel my energies. I am also very much a straight shorter therefore have learned over the years to use a softer approach in how I communicate and sell in ideas. I watch my 10-year-old daughter in action – you always know where you stand with her as she doesn’t mince words. I love her genuine nature and know she will learn to soften her approach as well when she grows up. As the years grew on in the fashion industry my skin certainly grew thicker – I managed to stay calmer and I quickly realized that you are nothing without your team! 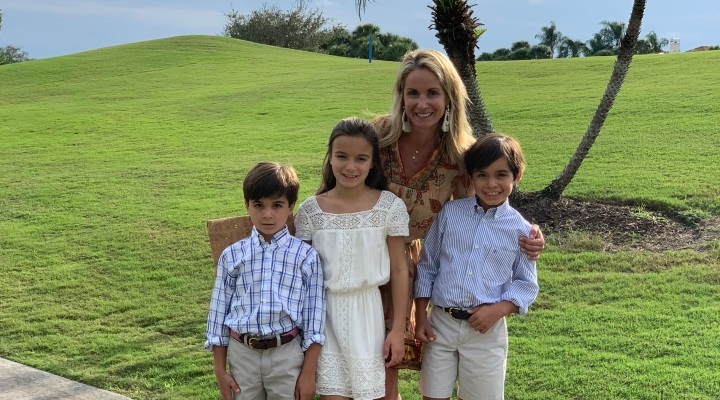 Being a mother of three children all a year apart has also made me stronger in business as I continue to learn to overcome challenges, multi task, and take one day at a time. My children have really put stressful situations at work in perspective for me. I am much more empathetic as well and have slowed down instead of steamrolling everyone a hundred miles plus! They will always come first. After all, it’s just clothing! I am constantly networking and socializing. I love to be out and about talking to as many people as possible at restaurants, parties, special events & store functions. I always learn and take something from every person, interaction or experience whether positive or negative situations…it all builds character and goes in the tool box for a later date. Most importantly, no matter what you’ve been through – it’s about figuring out how to come out on the other side. The ability to remove and overcome obstacles – to be a winner even when all the odds are stacked against you. Networking is key to any type of brand for PR & marketing and ultimately sales. Making connections that may not seem important right now, may turn out to be key later. I always try to help others in business as I believe what goes around comes around. I’ve found people who cut others down are insecure and not team players. It’s always best to build others up and surround yourself by strong players as you will only get stronger and smarter! What is one marketing strategy besides referrals that you’re using that’s working really well to generate new business? Instagram, Facebook, and all social media channels. I think it is key to be on the forefront of technology for consumers and always being open to change and doing things differently and better. Outsmarting the competition while staying true to your own brand. A key strategy is to maintain a presence across channels while understanding the nuances in distributions and how to optimize these opportunities especially in the online space. Probably our recent divorce. The notion of breaking up a “family” and the pain on the children is heartbreaking. However, I know it was the right decision and overtime it will be better for them to be in an environment where parents aren’t fighting and are loving, kind, patient and supportive of each other. I know it will be a slow progress but the children are everything. They are fortunate to have two parents who love them more than anything – they will always come first. I don’t regret having married my ex-husband as I truly believe we are blessed with three of the most amazing children who endure all. I’m very driven, and hard working. With my sports background and the fact that I’ve always worked, that’s all I know. I’m just focused and disciplined to take care of myself. When I see the customer excitement with the products and brands that I’ve help create. I feel fulfilled bringing a vision to life and knowing that consumer and market needs are being met…therefore successful driving business which ultimately creates brand awareness and equates to sales! The future is to continue to create new and compelling products and brands. Finding opportunities in the market and working with e-commerce and social media opportunities that are up and coming. Technology keeps changing, so we must be agile and figure out how to explore options and be compatible. Staying up with all the changes in the competitive marketplace especially in retail is key! We must be on the forefront to keep the business growing. I would say probably Emotional Intelligence. It’s by Daniel Goleman and it talks about how our rational mind and emotional mind work to shape our destiny. Don’t take things personally or let your emotions get the best of you. Tapping into and maximizing your best qualities and learning to constrain emotions and compartmentalize those that hinder you from pushing forward and overcoming challenges. I think it would be the social media marketing efforts focused around influencers and key partnerships. Blogger inspirations and brand collaborations. Upgrades to our E-Commerce platform. What advice would you give to females getting into business? I would tell them to believe in yourself and your idea, first and foremost! Absolutely keep following your dreams and take the necessary risks! You never know which avenue is going to be the one that really gets you to where you want to go but you have to start somewhere on your journey!